Tennis Australia accused firebrand Bernard Tomic of deliberately trying to sabotage the nation's Davis Cup team in a nasty spat with Hewitt. Adelaide: Tennis Australia accused firebrand Bernard Tomic on Saturday of deliberately trying to sabotage the nation's Davis Cup team in a nasty spat with captain Lleyton Hewitt and withdrew all support for him. Hewitt responded by washing his hands of the player, alleging he had been blackmailed and physically threatened by the combustible 26-year-old. "Now, he is deliberately trying to damage that culture -- and not for the first time. "We have given (Tomic) more than a decade of support. Ultimately, we have to draw a line when the behaviour does not warrant the support." John Tomic claimed the incident in 2010 left his son traumatised. He alleged Hewitt came to his son's hotel room during an Australian tie against Taiwan in March 2010 and pressured him to reveal who from Tennis Australia was telling him what to say publicly. Hewitt, who was not playing after hip surgery, had at the time been highly critical of TA during a period of turmoil for the sport's governing body. Tiley said it was the first he heard about it. 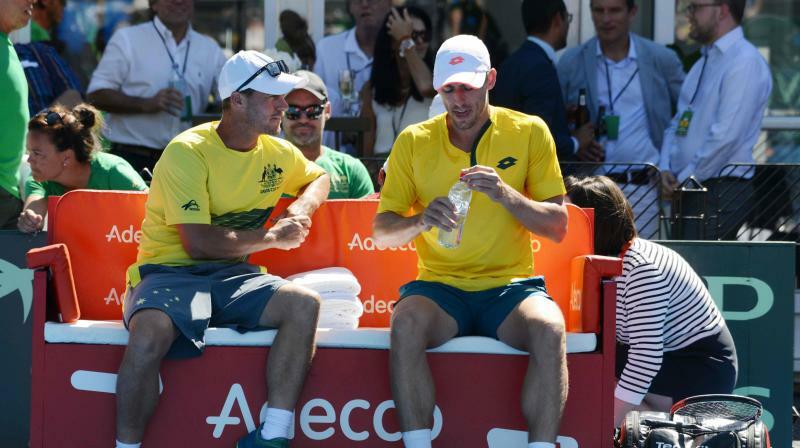 "Both Bernard and John have enjoyed a lot of support since in many areas of their lives -- including a long and sustained period of personal commitment and whole-hearted effort from Lleyton Hewitt as Davis Cup captain." Tomic, who rose to a career-high 17 at his peak, has not played Davis Cup since 2016 and claims Hewitt "doesn't put the players first". Australia are currently playing a Davis Cup qualifier against Bosnia and Herzegovina in Adelaide.